My in-laws, Rita and Louie Cinquino, are both 88, and have been happily married for more than 65 years. That’s happy with a little h. They annoy the heck out of each other, and complain about each other behind their backs all the time, but after 65 years they are like a fine-tuned machine, even if lots of the parts don’t work. He can’t walk, but he can still drive. She’s never been able to drive but she sure can cook. So can he, actually. The sad fact is they are finding it harder and harder to do the basic things of life. Oh, they still live on their own, and their house is surprisingly clean and unchanged since the last time we came to visit. But this time we are here to work for them and help them get ready for winter. And as I do Rita’s cooking and listen to her complain about how I can’t do laundry (she is correct), I think about how their longevity has broken almost every rule we’ve ever listed on Rodale.com. She microwaves every single thing in plastic—usually in thrice-used Cool-Whip containers. They consider the greatest sin of all to be a meal without dessert. And all their lives, their idea of exercise was called hard work. They do eat fish once a week—on Friday—but it’s usually batter-dipped and deep-fried with a side of french fries. Once I made them salmon, and my mother-in-law asked for ketchup! Now, they do go to Silver Sneakers (a senior fitness program) three times a week. And they have shelves full of amber pharmaceutical containers. If they can’t get to church, Rita watches it on TV (however, their most commonly watched channel is Fox News). But food, Italian food, is, I believe, the secret to their health. See, they are both 100 percent Italian and don’t ever forget it. They grew up poor, discriminated against, and eating foraged foods and whatever was cheap. And that’s probably what saved them. But it’s not just them. Of all my mother-in-law’s siblings, the only one who has passed away was the skinny nutritionist (from cancer). The rest of ’em are still alive, with nary a low BMI amongst them. Same on my father-in-law’s side. He’s lost a few siblings, but there are still a lot of them left and they’ve all been married for 50 years or more. And let me tell you, it’s all about the food (and church, too). While here I’ve cooked three Zucchini Delight casseroles for the freezer (the zucchini was given to them by neighbors, of course). And four containers of marinara sauce (tomatoes, mine; garlic, my father-in-law’s). It’s all cheap, mostly vegetarian and delicious. (I am writing this, by the way, to the sound of Hail Marys being recited over and over on TV). While I was cooking, my husband took them out to pick out their caskets. I’m not making this up. Louie’s has the last supper on it, and Rita’s, the Pietà. They don’t want their kids having to decide (and argue) about what to do after they die. They are not worried because they are surely going to heaven. For the remaining family, it’s a little more complicated. My husband is definitely going to heaven. But the rest of us might just enjoy the immortality bestowed by Rita and Louie’s recipes. Now, you can too. Zucchini delight, ready for a light baking and a deep freezing for a nice winter meal. 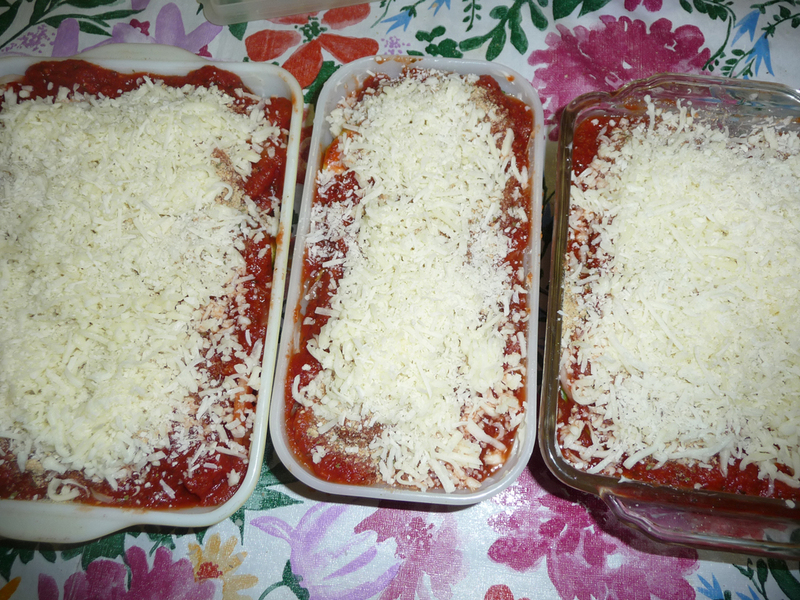 Take a casserole pan and layer tomato sauce, zucchini, onion, breadcrumbs, mozzarella cheese and Romano cheese. Repeat (ending with the cheese on top). Bake in a preheated oven at 350 degrees F for about 30 minutes, or until bubbly and golden. If you are going to freeze it, be sure not to overcook it, and let it cool before you cover it and put it in the freezer. Don’t forget to label it, or you might not remember what it is. Remove the skins from the tomatoes by letting the tomatoes sit in boiling water for a minute, then burning your fingers as you peel off the skins. Put aside in a bowl. In a big saucepan, sauté lots of chopped garlic in olive oil. Add the tomatoes, basil, and salt to taste. Cook for about 30 minutes. This sauce can be doctored up in a number of ways. For richer sauce, add butter or cream. For a clam sauce, add a can of chopped clams. Experiment with adding more herbs or a few vegetables. You can even add hard-boiled eggs! Since the sauce is a bit watery, it always benefits from letting the pasta sit in the sauce for five minutes before serving. Always top with Romano cheese. The deal with these recipes is that it’s hard to go wrong. If you like garlic, add more. If you hate it, take it out. If you love herbs, add as much as you want. If you hate herbs, avoid them completely. 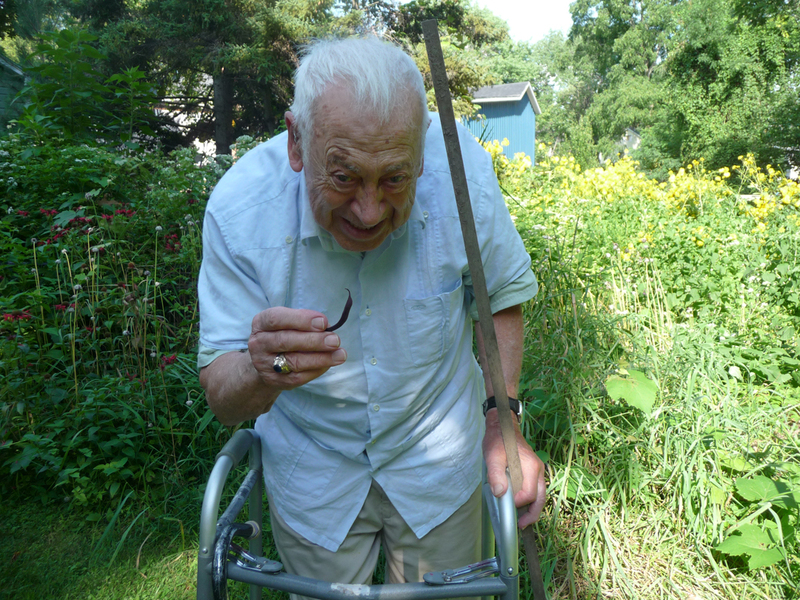 My father-in-law’s harvest of one purple string bean…it’s hard to garden when you’re 88! 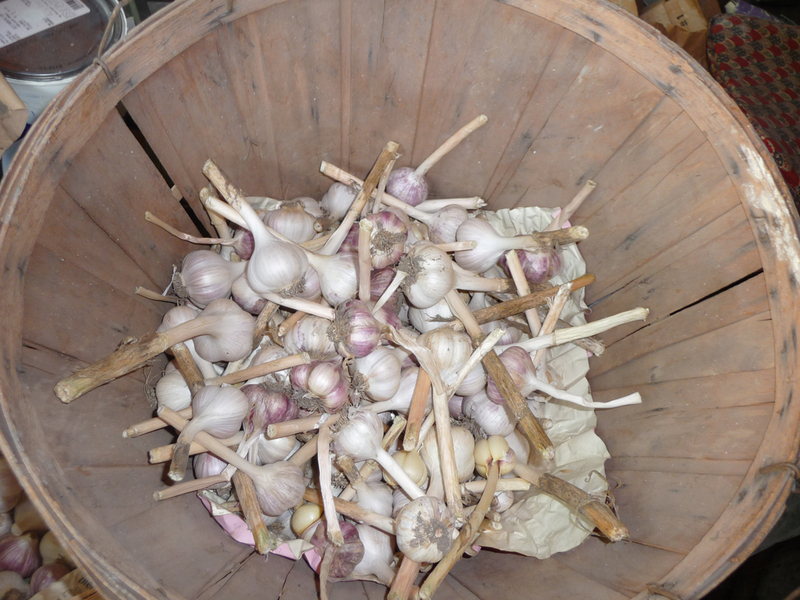 Although he got a real good garlic harvest…it’s one thing groundhogs don’t eat. My father-in-law Louie Cinquino has managed to save the centerpiece from our wedding 17 years ago—the pot and the seeds we included as favors (wild seeds of love!). 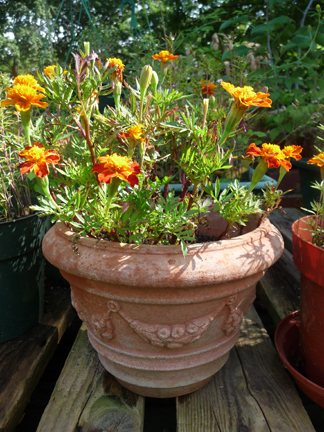 He has saved those marigold seeds and, every year, planted some in the pot. Wonderful story. My husband used to say that both his parents together made 1 kind of whole person…his father had trouble walking and Parkinson’s, his mom had a stroke, but together they made up it in many ways. He was grateful, though, that we lived within driving distance because they still needed a lot more help than they were willing to admit. It’s great that you are able to visit and help them when you can. My mom (87) and dad (90) garden by buying the seeds and telling me and my sibs where and how to plant. They’ve had a garden for 50 odd years and see no reason to stop now even though they really can’t manage it by themselves. We also pick and prep most of the yield for their freezer. That is all so rich! I love it. You and Lou both come from amazing families. That’s so heart warming. That’s so Italian! Don’t forget stubborness, as an attribute to longevity. Personally, I think that it is all of the olive oil and garlic. Mangia! What a great story about your Inlaw’s. I can’t wait to try this recipe.